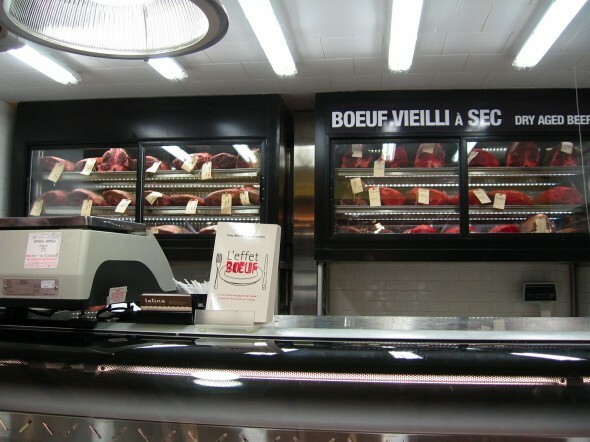 Last week at B&M Restaurant on St-Viateur two esteemed butchers armed with nothing but cutting boards and, well, knives, faced off against each other and two whole lambs. 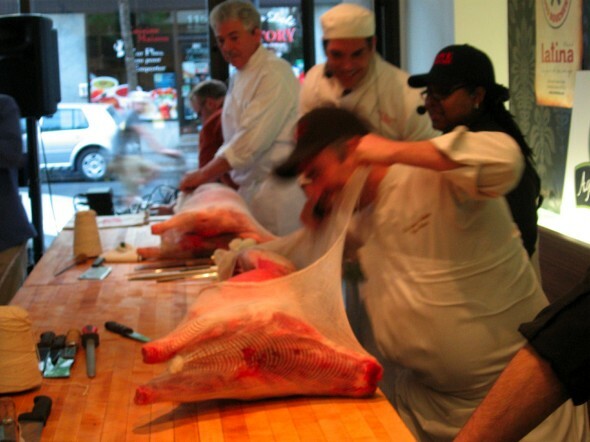 Their goal: to break them down into the nicely tied shoulders, legs, neck, chops, filet, loin, ribs, rack and all the odd bits we see - or don't see - in butcher shops. 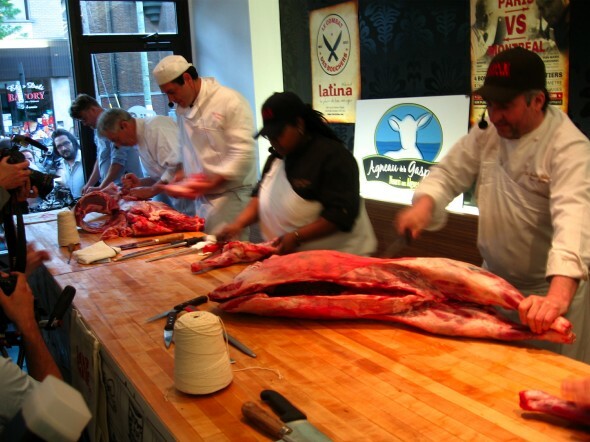 They took two giant slabs of cleaned meat and raced for 30 minutes to see who could do the best job. 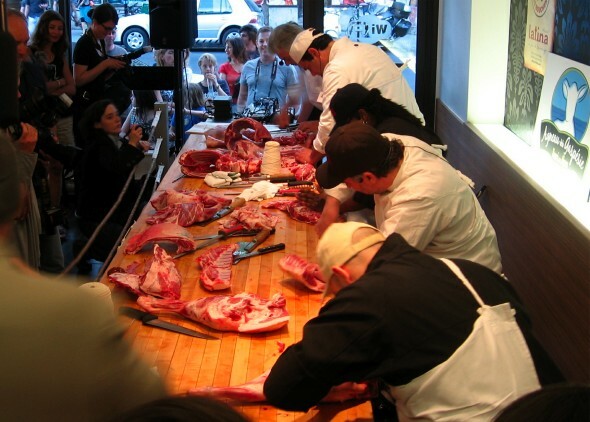 The butchers: On this side of the ring, Épicerie Latina Grocery's in-house master butcher, Bernard Coat, versus world butchery champion, Yves-Marie le Bourdonette from Paris who flew in with his team of two assistants. They'd done this before. Latina's man had only one assistant, Alexis Bissonnette, and struggled with the time limit. The Canadians wedged rosemary branches under butcher's twine in the roast. 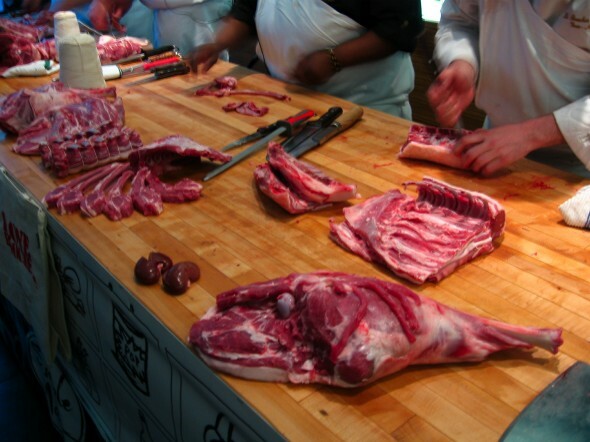 The Parisians made inappropriate jokes while stroking the flesh, then splayed out a piece of flesh on top of the lamb leg like limping octopus arms. turned a part of the leg into a kind of octopus. And while that just sounds ridiculous, and certainly doesn't help the meat to cook evenly, it looked really cool. 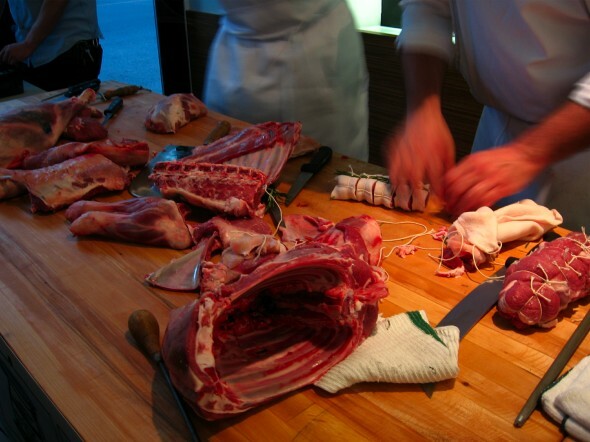 And that was what the event was about - making butchering cool. The people staring into the event from outside B&M's windows certainly though watching two lambs being broken down into manageable chunks was cool. And the people inside sampling cheese, smoked salmon, cider, beer, fruit, paté and desserts from Épicerie Latina agreed. Before the competition started and the lambs were heaved in on the shoulders of some men much stronger than I ever want to be, us press types took a guided tour of Latina. 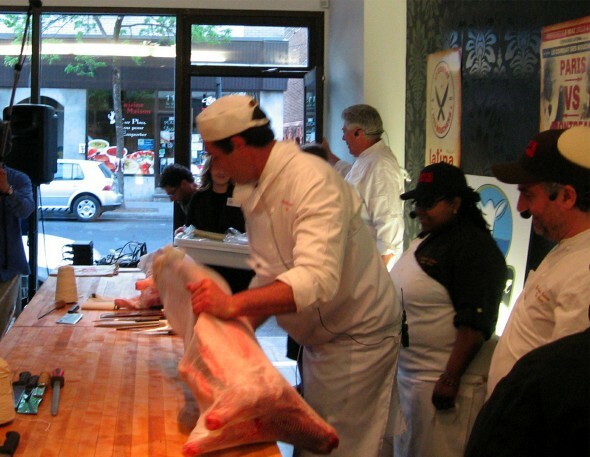 I've shopped there before and heard from chef friends that their meat is very good, but it was only when the guide pointed out the dry aging meat hanging behind the butcher counter that I actually understood what they'd meant. And I'd never noticed the signs on all the cheeses indicating where they come from and if they're raw, thermised or pasteurized. And there's actually someone in charge of produce. The baby bok choy came in that morning from a greenhouse less than an hour away. They were crisp and beautiful. Pity they weren't labeled as well as the cheese. You'd never know your bok choy was local. It's not the cheapest store, but you get what you pay for. Back to the lamb. 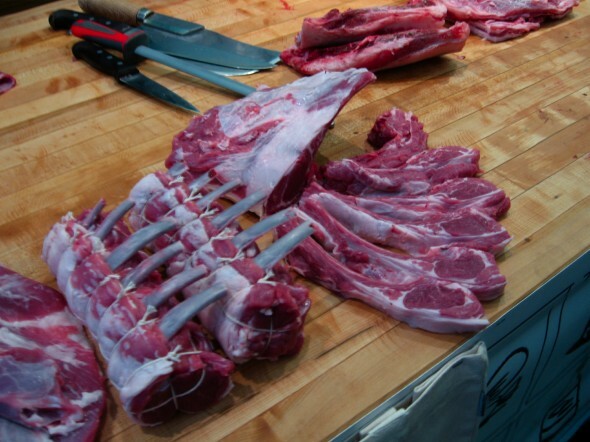 When you carve a rack you have to gently scrape the flesh away from the rib bones (at least I think they're rib bones). That's after you whip out the hacksaw and turn it into appropriately sized pieces of rack. The leg seemed awfully complicated too - picking away at the excess fat. The butchers had to waste as little as possible, but their waste buckets were full of white fat by the end. I hope B&M inherited it and rendered it for their home fries. 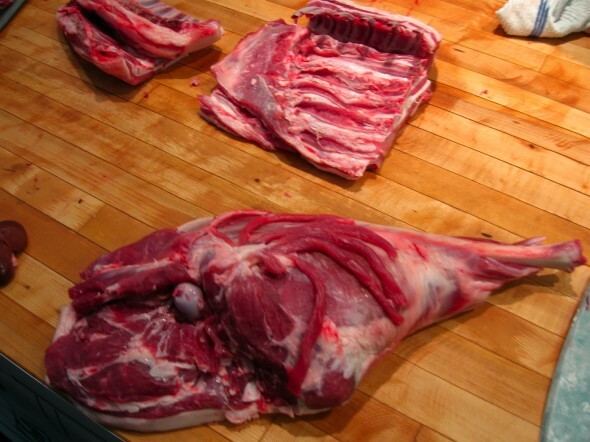 Slowly the lamb turned into recognizable pieces while the butchers sweated. Could I tell who was doing a better job? Nope. 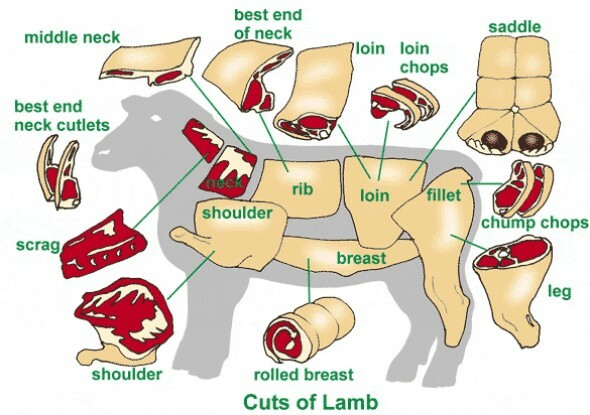 Whose leg of lamb was nicer? No idea. Who had cut the shoulder properly? 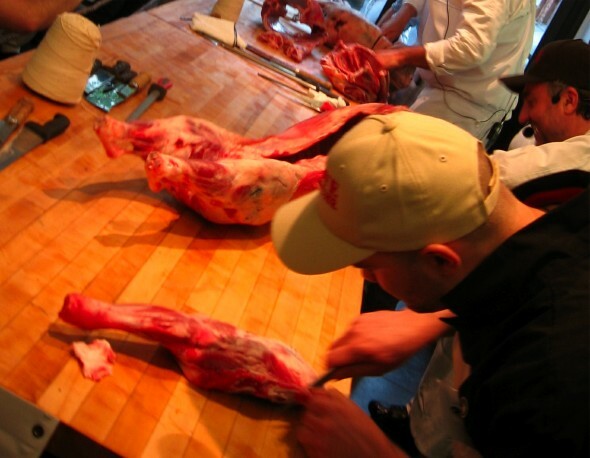 What demonstrates lamb butchering artistry? No idea. But who won? Paris. Definitely Paris. But they had a man advantage. Actually, a woman advantage. Who would I want as my personal butcher? Montreal. He was respectful and dignified, not soliciting the crowd's laughter. I would have shaken his hand but it was covered in lamb. Instead, I nodded, congratulated him, and told myself I'd be back to Latina to buy meat the next time I was craving dry aged beef or freshly butchered lamb. I hope whoever got to take those hundreds of dollars of meat home enjoyed it all. 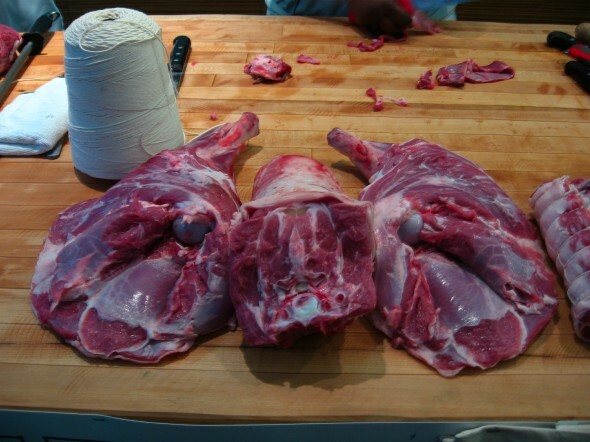 Photo of cuts of lamb from Easy Cooking. OK, so I have been friends with your ctsoumer Doris McDowell for about a year and a half and I am just now hearing about this. PUT ME ON THE LIST, even if all you currently have available is dandelion greens and dirt. Of the 20-odd 1950&#8242;s sci-fi authors I&#8217;ve read this past year, Wyndham&#8217;s probably my favorite. I&#8217;m partial to The Chrysalids, maybe because that was the first Wyndham novel I read and it&#8217;s stuck with me.And yes, he does treat women in his books much better than the typical sci-fi author of the time. doprava zadarmo nike magistax proxima ii tf futbalov??? top?? ?nky p?? ?nske ed??? ierna zelen?? ?